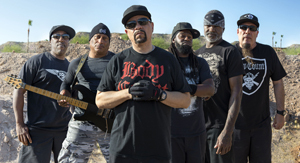 BODY COUNT (Featuring Ice-T On Vocals) has just released a new music video teaser for their upcoming single, "No Lives Matter" The scathing track comes off their much-anticipated new, full-length album, Bloodlust (Century Media Records). Look for the official music video to drop on Feb 17th and more info pertaining to the album will be announced in the coming weeks. Check out the teaser below. Ice-T states: "With our last album Manslaughter, we tested the waters and got a great response from the fans and critics. Now it’s time to go kill it and make a more aggressive album and keep the BODY COUNT style intact." Ice-T and co-founder/lead guitarist Ernie C have perfected their mix of thrash, punk and bottom heavy doom across five albums, hitting a zenith with the unstoppable Manslaughter. They embody the monumental Southern California tradition of street born punk bands like SUICIDAL TENDENCIES combined with the aggressive aural napalm of SLAYER. This is abrasive, in-your-face heavy metal at its very finest.